Factual information alone isn't sufficient to guide you through life's labyrinthine tests. You need and deserve regular deliveries of uncanny revelation. One of your inalienable rights as a human being should therefore be to receive a mysteriously useful omen every day of your life. The practice of attempting to foretell future events or discover hidden knowledge by occult or supernatural means. 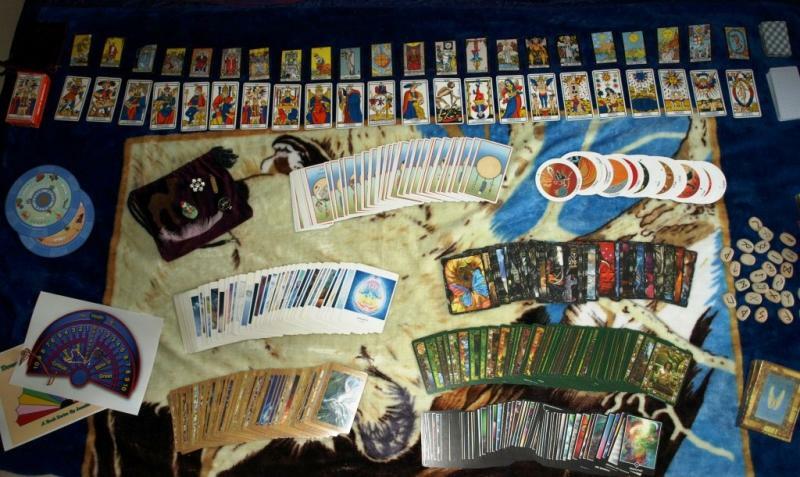 Divination is the practice of using tools, (Tarot Cards, Rune Stones, I-Ching Coins, etc. ), to transcend human or normal consciousness in order to reveal hidden (or "occult") information to the conscious mind of the seeker. This information can be used to reveal that which is not known to the seeker in the present and/or possible future. The accuracy of the information can only be tested by using the information, and in so doing one becomes a part of the experiment rather than an independent observer, therefore it is not a testable phenomenon by empirical standards. 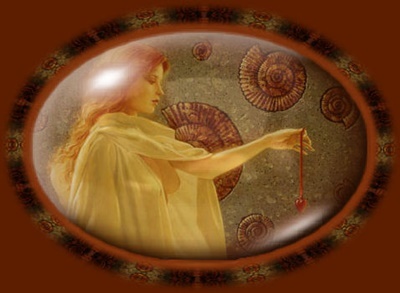 Many people confuse the practice of divination with fortune telling. Fortune tellers use the trappings of divination, combined with psychology and showmanship, to create seemingly amazing knowledge of the present and startling predictions of the future events. Because many people are susceptible to the theatrics of the fortune teller’s performance often self-fulfilling prophesies may arise. 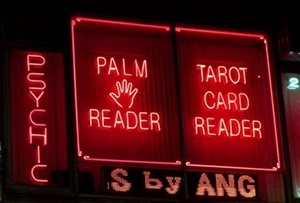 Unfortunately some fortune tellers cross the line and deliberately attempt to play on the fears of the subject in order to keep the person coming back o﻿r in truly heinous situations to extort money by selling protective amulets and spells. Perhaps a good way of differentiating divination from fortune telling is to think of divination as part of an individual’s self study process with the goal of achieving spiritual awareness and to think of fortune telling as that which is done for an individual, by a 'reader', for the purpose of revealing the solution to a singular problem or situation in exchange for a fee or other consideration. Many people also confuse divination with prophecy﻿ which the dictonary defines as "uttering by or as if by divine inspiration to reveal the will or message of God". This is vastly different from divination wherein the unconscious resources which the diviner taps into are those of the individual or collective unconscious, but prophecy supposedly comes from a direct connection to some deity or other supernatural entity “speaking” through a prophet often with some Biblical or other scriptural correspondence. Additionally, divination primarily focuses on an individual, while prophecy is usually focused on world wide implications﻿ of some scriptural passage's prediction of which 'The Mayan Prophecy' and 'The Rapture' are just two modern day examples. The mind exercises a powerful influence over the body. From the beginning of time, the sorcerer, the interpreter of dreams, the fortune-teller, the charlatan, the quack, the wild medicine-man, the educated physician, the mesmerist, and the hypnotist have made use of the client's imagination to help them in their work. They have all recognized the potency and availability of that force. The desire to foretell the future has been a part of the human psyche since the dawn of mankind and it continues to this day. Every new age shop has its psychic readers on duty to tell your fortune if you cross their palm with silver and Sunday morning TV is crammed with preachers interpreting the proverbial “signs and omens” of scripture that foretell the Apocalypse that is about to befall mankind and show you how to be among those who will escape the judgment of God if you call in now and make a donation. People often turn to divination and prophecy because they are scared or desperate and most likely suffering pain. People are worried about what is going to happen to them and need reassurance. That is just the way we poor mortals are. We are still the primitive creatures alone and frightened in the darkness trying to find some hope that we will make it through the night and see the Sun rise again in the morning. We seek a deeper meaning in what we see around us. If primitive man had not been seeking for a deeper meaning in the Moon that lit the darkness he would not have come to know the Moon’s phases and learned to be able to use them to predict the ebb and flow of the tide. By watching and waiting for the rise of the Sun early man saw how the changing position of that Sun heralded the changing of the seasons and knowing that man learned when to sow and reap according to the progression of the Sun. Thus began the study of astronomy as man realized how the lights in the sky affected his physical world. Early man looked again to the heavens and saw how the lights affected his spiritual world as well and thus began the study of Astrology. Sadly, it is in the nature of people to get lazy and to stop seeking answers to difficult questions for themselves. They still want to know what fate awaits them, but they do not want to do the work for themselves. It is often too much bother for them to take the time to study and learn, (or even to take time to pray), when it is so much easier to pay someone else to do it for them. Once this happened the fortune teller (and the preacher) arise to tell them what to believe ... and what to think. Divination should be approached as a sacred art and a profound ritual, imbued with meditation and reflection on the part of the seeker. It is a valuable tool that will reveal many answers for you that will in turn lead you to even deeper questions. But, if you really want to know what amazing things are to be discovered you need to learn the art of divination for yourself and not rely on others to tell you what they discovered. "Divination is the ketchup of shamanism." S. Kelley Harrell makes a very good point in saying that “divination is the ketchup of shamanism”. To take it a step further, it could be said that "divination is the 'jam' that is made from the fruit of The Tree of Life”. "Divination Jam” is the first sweet mystical treat that most people get to taste. Like children who have their first taste of jam, they have no real understanding of the actual fruit from which it is made and no comprehension of the intricate nature of the tree that the fruit comes from, nor of the roots of the tree drawing on the life giving essence of Nature. Most who take an interest in the Tarot, the Runes or the I-Ching do so because all they are interested in using them for fortune telling. They see divination as a jam that they can spread on that piece of bread that represents the one part of their life that they are foused on at the moment. For them, that jam is all they desire at that moment, to make the bread a bit more tasty and once that piece of bread goes down they move on. Some may want to learn how to make jam themselves and they pick pieces of fruit from the Tree and cook them up in their metaphysical pot. Often they just want to be able to have more jam for themselves, but just as often they want to be able to impress others with their jam making ability and to make money by selling their jam at the fair. A few though begin the appreciate the great gifts that the Tree itself has to offer and they wish to learn how to nurture the tree and cultivate its blossoms and its fruits in a spiritual orchard. Divination is therefore a gateway that opens onto a path to that orchard. There is jam from that orchard at the gate if that is all you want, but if you take the time and make the effort to venture into the orchard you can experience the true nature of the Tree that the jam is only able to hint at.